WASHING TON — It’s not uncommon for winemaker Steve Monson and his staff at Early Mountain Vineyards to work around the clock during fall’s harvest months — and nightfall is perhaps the most exciting time of these 24-hour days. That’s when the vineyard’s team ventures out into the rolling hills of the winery’s 52 acres to pick the grapes at their ideal wine-making temperature. Last year’s harvest at the 3-year-old Madison County, Virginia, estate resulted in 6,000 cases of wine. And while most bottles from the harvest won’t be released for several more months, about 600 cases are currently being enjoyed by a growing base of wine connoisseurs: the rosé-lovers. What was once thought of as an overly sweet wine with a fate destined for a budget-friendly box is now experiencing a renaissance. In fact, 2014 marked the ninth straight year of double-digit growth for rosé wine in the U.S., including a 39 percent jump in 2013. Experts say the change in the pink-wine perception has a lot to do with an improvement in the wine’s quality and in the winemaker’s approach to rosé’s production. For years, rosé was treated as an afterthought. Many winemakers would blend their white wine with a little bit of juice produced from the red to yield a wine pink in color. But for Monson and a growing number of producers, rosé’s production is premeditated. “We grow our vineyard specifically to make rosé,” says Monson, who adds that Early Mountain Vineyards’ blocks of Malbec and merlot vines are grown for its production. Wine drinkers are taking notice of “new” rosés for their flavor profiles, which are much different from what Monson calls “old-time rosés.” They’re drier, lighter and “more elegant,” Monson says, making them ideal for summer’s warm afternoons and evenings. Early Mountain Vineyards releases its rosé wine around the first of April every year to cater to the springtime demand. Swati Bose, owner of Flight Wine Bar in Northwest D.C., serves rosé throughout the year, but says she notices a spike in the number of bottles and flights ordered between May and August. In addition to serving the traditional dry and crisp French Provence-style rosé, Bose also pours bolder, more full-bodied varieties from countries such as Hungary and Italy. At her Chinatown wine bar, she offers customers an opportunity to experience the different flavor profiles, side by side, in a rosé flight. Bose says cheese, charcuterie and olives are great appetizers to pair with any style of rosé, while seafood and meat hold up nicely to a full-bodied blend. Just because rosé is most commonly consumed as a warm-weather beverage doesn’t mean it’s limited to summer sipping. In fact, both Bose and Monson say it can be enjoyed year-round. Unlike Bose, Monson doesn’t offer a global sampling of rosés in Early Mountain Vineyards’ tasting room. He will, however, pour visitors some of his favorite Virginia wine varietals. It may sound odd – promoting another business just down the road – but Monson says the state’s winemaking community is collegial, and promoting all Virginia wine is central to the winery’s mission. “We see ourselves as, really, a platform for discussing Virginia wine and the quality that’s already here. We’re not trying to reinvent the wheel or push the ball forward; we just want to act as a microphone for the quality that’s already in this state,” Monson says. Luckily, Early Mountain has the financial backing and support to be the state’s microphone. It’s owned by AOL co-founder Steve Case and his wife Jean, who, Monson says, have been fans of Virginia wine for decades. The Cases purchased the vineyard in 2011, and have since invested in state-of-the-art equipment and knowledgeable staff to produce a product worthy of national attention, while staying true to the state’s tradition. “We really want to make wines that are pure of place, and the way to do that is to make wine the way it could have been made 100 years ago,” Monson says. In addition to rosé, Early Mountain produces everything from merlot, to Chardonnay, to a reserve pinot grigio. In the next three to four years, the winery plans to grow its operation to produce about 10,000 cases of wine, or roughly 120,000 bottles. But first, it has to grow local consumption. Monson says about 4 percent of the wine consumed in the state is Virginia wine. And while the tasting room is packed on weekend days, Virginians aren’t going home and drinking Virginia wine. But that’s not to say diners, chefs, sommeliers and restaurateurs aren’t taking notice. This year, Early Mountain Vineyards landed on the list of finalists in the annual RAMMY awards for Regional Food and Beverage Producer of the Year. Monson is excited about the future of Virginia wine: He says the state is great at making cabernet franc and merlot, and he sees tannat and petit manseng coming to the forefront. 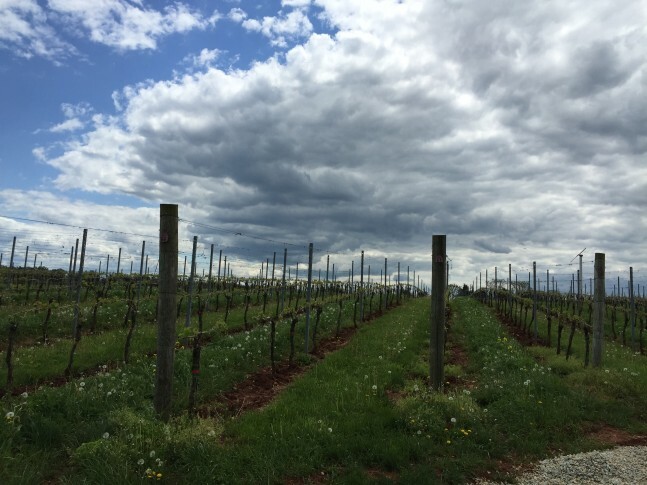 He also adds that many winemakers in Virginia are willing to explore new varietals and styles, which sets the state apart from other wine regions. For example, in 2014 Early Mountain experimented with a saignée rosé.